To many outsiders, certification seems a simple issue. When I started writing I initially thought it was a simple issue! However, since there are many kinds of doulas with different philosophies and life experiences, the issues with certification are quite complex. Now in 2018, I can see they involve capitalism, nurturing, legitimacy, social change, politics, systems thinking, race, class, culture, and how we value care work in American societies. The 15 essays bundled into this book explore those issues and were written between 2013 and 2015. They are now more accessible in this formatted downloadable pdf book. If you've ever found yourself asking, "Why can't doulas just get their act together? ", this book is for you. It's also valuable for legislators and policy makers; hospital birth doula program champions and administrators, doulas, doula trainers, and agency owners. Currently I am at work on a third book. It will explore more deeply the tensions between the doula movement geared towards social change in birth practices and the doula movement to increase the legitimacy of the profession of carework. 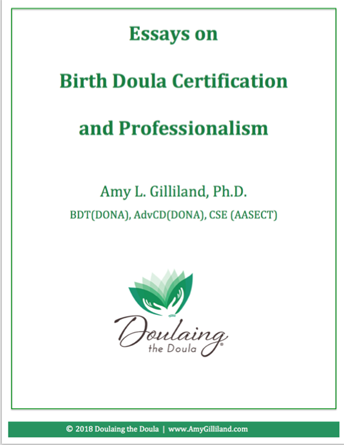 To download your copy of Essays on Birth Doula Professionalism and Certification, you'll need to sign in as a member of the site. Click here to sign up or be automatically directed to the download page. Look inside! Click for the TOC and a sample read!